Screens are everywhere and they aren’t going away. Ten years ago, televisions and video games were the only things competing for our kids’ attentions. Today smart phones and tablets are joining the competition and screen time is beginning to dominate the days’ hours. Quite simply, the stats are alarming: school-age kids spend an average of 7.5 hours a day in front of a screen, according to a 2010 study by the Kaiser Foundation. Younger kids ages 2-5 are also seeing a great deal of screens, as the Nielsen Company recently reported they average more than 4 hours a day. The most alarming part? Screen time has been linked to an array of childhood health issues; one study showed that for every hour of television per day, children consume an additional 167 calories. Another study showed a strong link between screen time and an increased risk in diabetes in children. Not only is an increase of screen time contributing negatively to kids’ health, but the very presence of it is preventing kids from being outside, a major positive in a child’s life. A 2012 study conducted by Seattle Children’s Hospital and the University of Washington found that almost half of preschool kids don’t play outside each day. And unfortunately, the number of inactive grade school kids is even higher according to a study published in the Archives of Pediatric and Adolescent Medicine in 2011. On its own, technology isn’t “bad.” But technology isn’t “good” either. Technology just “is” and we need to teach our kids (and perhaps ourselves) that we can live with it and use it without our lives revolving around it. What would that look like for your family? How could your family’s health and wellbeing be affected if you lessened screen time and increased your outdoor playtime instead? We hear these very questions asked often as we meet parents coming in to Happy Backyards looking at outdoor swing sets, trampolines and basketball goals in the hopes of giving their kids even more of a reason to get outside and play! Physical Benefits: Playing outdoors has been shown to engage and increase muscle strength and coordination and enhance kids’ ability to complete various physical skills. Plus, exercise is paramount to staying healthy; it strengthens the immune system and increases vitamin D levels, which are important for reducing the chances of diseases like osteoporosis and diabetes. Mental Benefits: Playing outdoors engages kids’ minds and imaginations. It has also shown to provide better focus in the classroom and increase critical thinking skills. Emotional Benefits: It’s hard to believe that kids in elementary school deal with anxiety and depression, but unfortunately it’s true. Outdoor play has been proven to reduce stress levels and increase a child’s ability to deal with stress. Outside play can also be a source of self-confidence leading to better self-image. Social Benefits: Being outdoors provides your kids with more opportunities to meet other kids and teaches them skills like negotiation and conflict resolution. These types of skills are critical to thriving in group environments throughout their lives. Convinced yet? 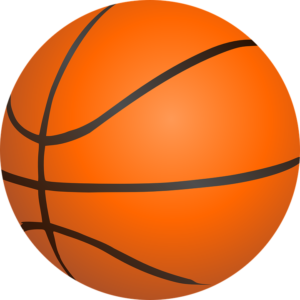 Beyond just the generalized benefits of outdoor play equipment, playsets, trampolines and basketball hoops all have their own specific benefits for kids and families as well. 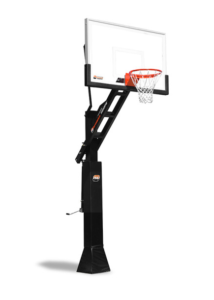 – Meaningful Family Time: A kids basketball goal is something that everyone in the family can enjoy, no matter their age or skill level – especially with an adjustable goal. And there are fun basketball games to play whether you have two family members or 10 family members playing together. 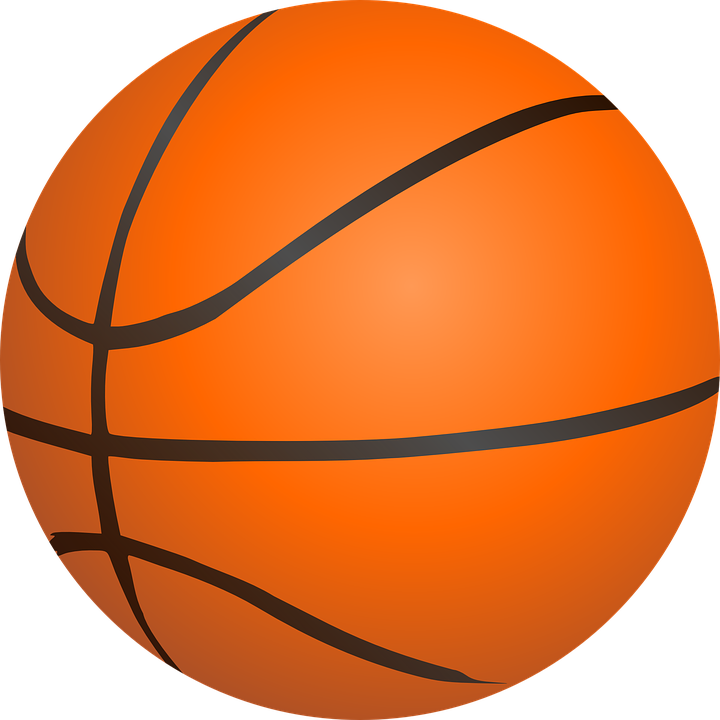 – Improved Coordination: Basketball is great for full-body exercise and hand-eye coordination improvement. 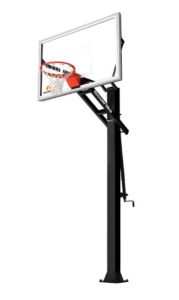 So even if your kids aren’t looking to be the next LeBron James, they’ll benefit from having a basketball goal in their driveway. – Efficient Exercise: NASA’s Journal of Applied Physiology cites a study that reports that rebounding exercise is 68% more efficient than jogging. 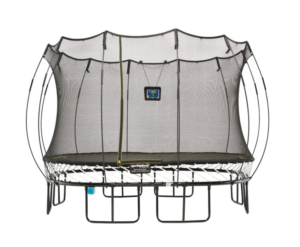 So this means that one hour of jumping on the trampoline would provide your kids with better health benefits than jogging or running for that same amount of time. – Increased Bone Mass. Studies have shown that the action of jumping and landing actually increases bone mass for people of all ages. 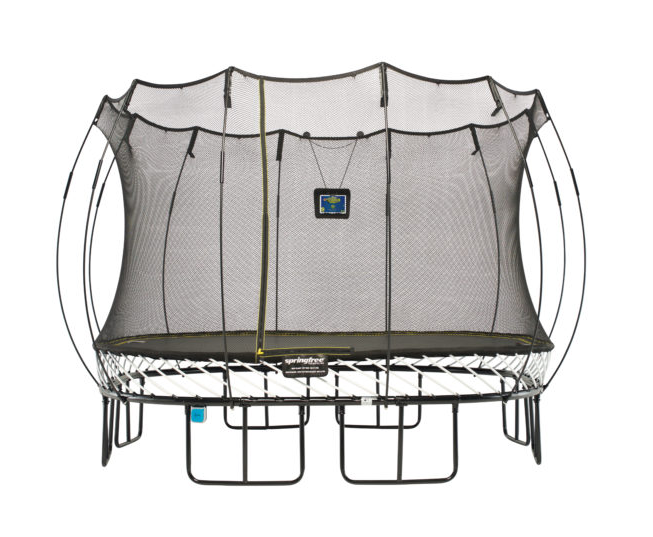 Overtime, this action can be hard on feet, legs, joints and back, but doing this action in a low-impact environment like the trampoline gives you the benefits without the long-term consequences. – Steadier Balance: Jumping up and down naturally stimulates the vestibule in the middle ear, helping the body to find balance naturally. Jumping can also help muscles with coordination and balance as well. 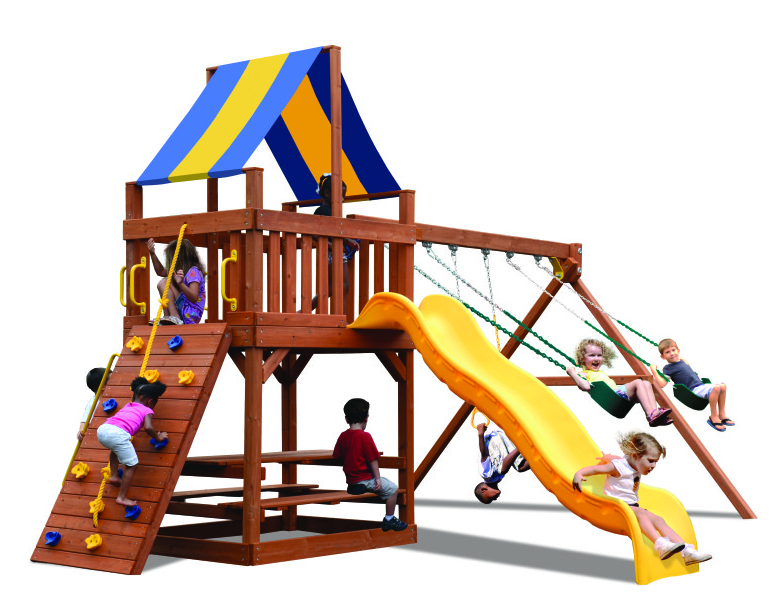 – Increased Strength and Flexibility: Playing on outdoor swing sets helps kids to increase their muscle strength, coordination and flexibility through things like swinging, sliding and climbing. – Creative Outlets: If you’ve ever watched kids playing on outdoor playsets, you won’t be surprised to know that kids who play outdoors have more active imaginations and are more creative than their peers who spend more time indoors. – Improved Fine and Gross Motor Skills: Doing activities like climbing on outdoor playsets and playing sports helps kids to increase their fine and gross motor skills. To summarize, kids who play outside are in better physical shape than their peers. This also equates to better long-term health that lowers their future risk for diseases like Type 2 Diabetes, hypertension and heart disease. Plus, being outdoors is a great way for kids to get Vitamin D and strengthen their immune systems. And whether they’re playing on outdoor playsets, trampolines or doing other activities together, playing with others increases kids’ social development. To ensure that short-term changes turn into long-term lifestyle change in your family, you’ll need some accountability in the form of people to walk along side of you. Here are some of our favorite FREE programs that you could use not only within your own family but in your community, schools and neighborhood, too. NFL Play 60: The NFL’s Play 60 program was launched in 2007, focusing on encouraging kids to participate in active play for at least 60 minutes a day. 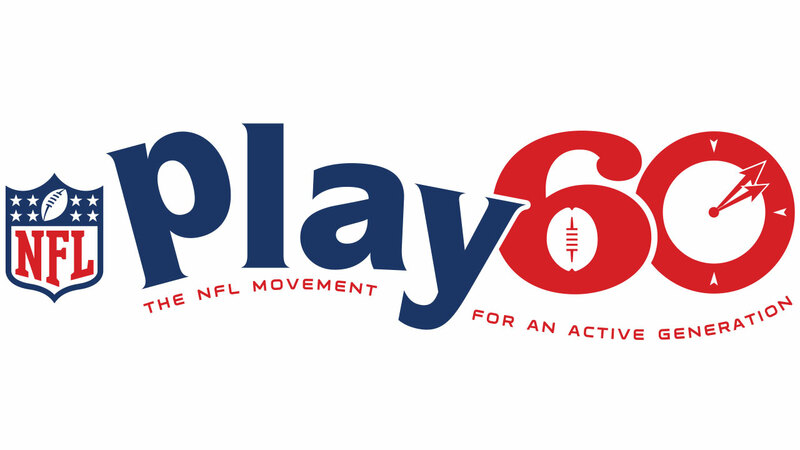 The NFL Play 60 site has great ideas for getting kids moving throughout the day and offers various school programs for your school to commit to implanting throughout the school year. 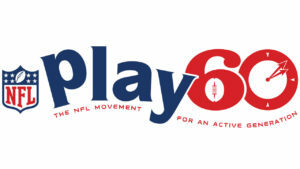 Those programs, along with more information about the mission of NFL Play 60, can be found here. Nike’s Let’s Move Schools: Similar to the NFL Play 60 program, Nike’s Let’s Move Schools program challenges schools to get kids moving for at least 60 minutes every day by implementing before, during and after school programs. 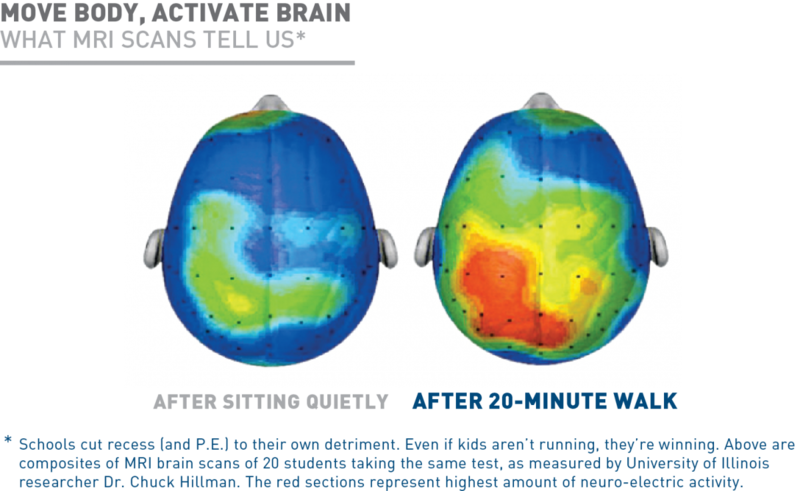 The site has good ideas for getting kids active as well as great information on building a framework for a more active school. There’s also helpful information for how school administrators, parents and the community can get involved in helping to make this a reality. Learn more here. Get Fit TN: Get Fit TN began as a response to the rising epidemic of obesity and Type 2 diabetes in the state. Their site offers free, easy-to-use tools and calculators to keep track of your health and fitness milestones. There are also separate sections for teachers and kids as well as a place to invite friends and family to join with you in group challenges and accountability. Sign up for your free account here. Setting goals, changing your priorities, finding accountability and making steady and small changes to your lifestyle are all critical to ensuring that your health changes “stick.” And while adding in activity is essential, unfortunately, making changes just to your family’s activity level alone is not enough. Once a Month Meals: For a small monthly fee, Once a Month Meals offers a variety of different menus and recipes to help you feed your family a healthy meal every night of the week. Once you build your weekly, bi-weekly or monthly menu (with options for paleo, gluten-free, etc. ), you can spend just one day prepping and freezing food so that your day-of mealtime prep is quick and easy. eMeals: Similar to Once a Month Meals, for a small monthly fee, eMeals sends you healthy tried-and-true menus that your kids will love, complete with a grocery list and through prep instructions. When you know ahead of time what you’re putting on the dinner table each night, it’s easier to stick to the plan and serve a healthy meal. Plan to Eat: Plan to Eat is another fee-based monthly meal planning service, but it allows you to pull recipes from blogs and websites and uses those recipes to build a grocery list and directions that simplify your meal prepping and shopping. 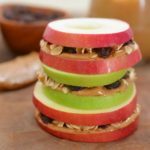 If your Pinterest page is full of recipes that you’ve never actually made, this site may be the conduit for actually getting those healthy meals onto your table! While making changes to your family’s eating habits may feel difficult at first, they will adapt quickly and you’ll be encouraged by the changes you will see in your overall health and wellness! Changing the trajectory of our family’s health and overall wellbeing is certainly no easy task. It starts with making changes to the way we view media and screen time and then taking steps to be more active in our every day lives. For your family, it may mean a major 180 on how you eat and what you’re eating. For another family it may mean cutting down on screen time and increasing outdoor play. For most families, it will be a combination of both of these. Once your family makes these changes, look for other families within your neighborhood, school and community to join in with you and support you in these changes. Small changes now can mean big changes and payoff in the future and for generations to come! 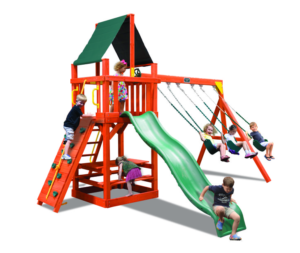 Happy Backyards wants to partner with you and your family by offering the highest quality and safest backyard play equipment available. If we can ever help your family with the purchase of a playset, trampoline and/or basketball hoop that’s right for you, we’d be happy to help. 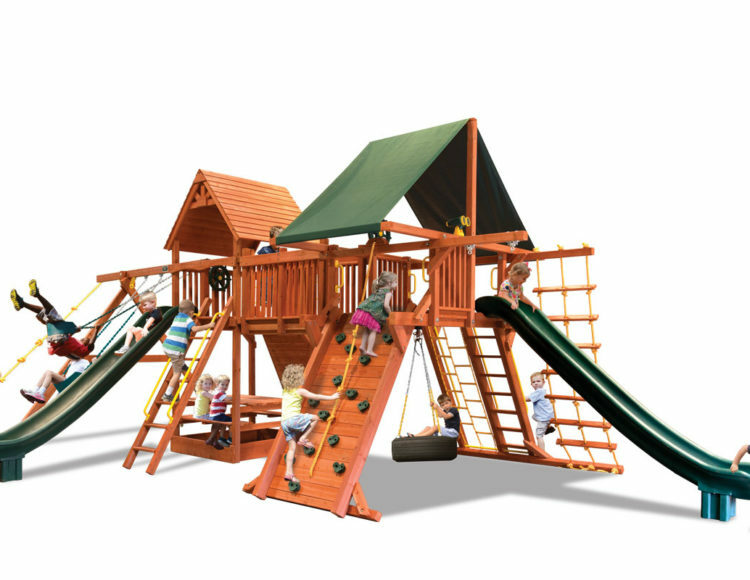 We specialize in helping you choose what’s best for your kids, your space and your budget so that your backyard will always be a happy backyard!